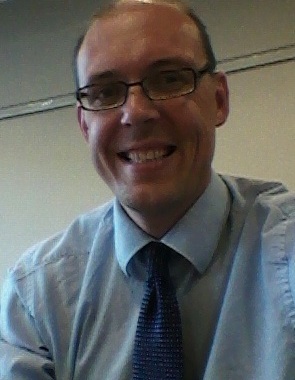 The research project summarized in this article was conducted as part of the requirements for degree of MSc Computer Science at Nottingham Trent University in the UK. For this project, I created an Open Wonderland Chatbot Module. A chatbot is a virtual character that simulates an intelligent conversation with humans. 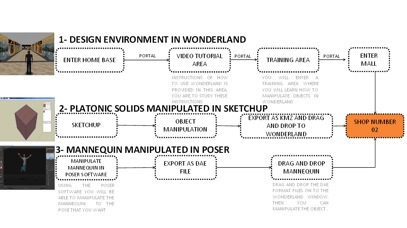 The main purpose of this project was to extend Open Wonderland’s non-player character (NPC) functionality to interact with human avatars. 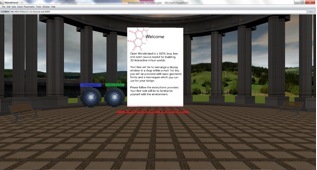 The chatbot is embedded in a virtual campus simulated learning environment (see screenshots of the virtual campus). The main purpose of the chatbot is to communicate or guide users to solve their problems. 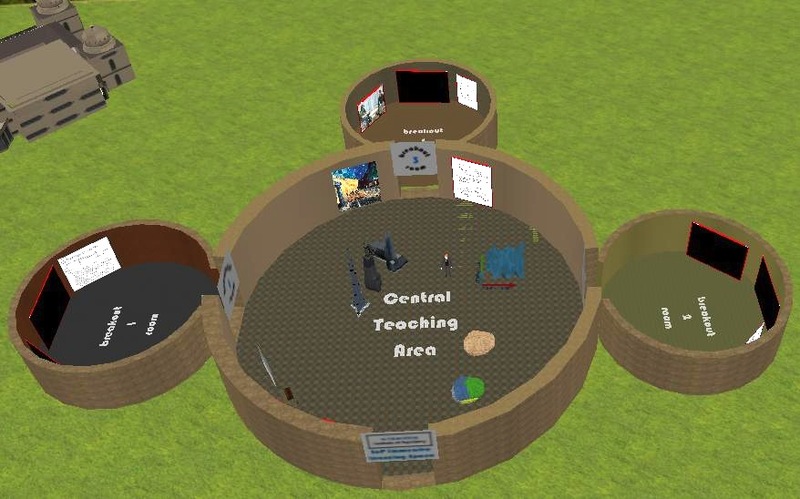 Virtual campus in which chatbot is integrated. Here is an example of an integrated chatbot window in which a user has engaged in a conversation with the chatbot from inside Open Wonderland. While chatbots can be used to simulate conversations that convince people the bot is a real person, they can also be used as an advanced search engine to retrieve factual knowledge for users. 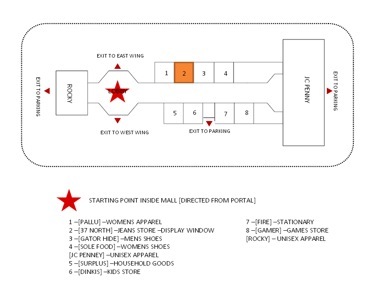 Initially, my intention was to develop a basic conversational agent program which could perform keyword-matching to scan for user inputs and generate replies. 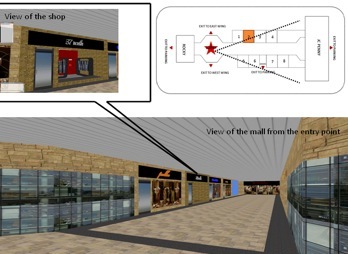 In the final project, however, I instead integrated a highly developed existing artificial intelligence engine. 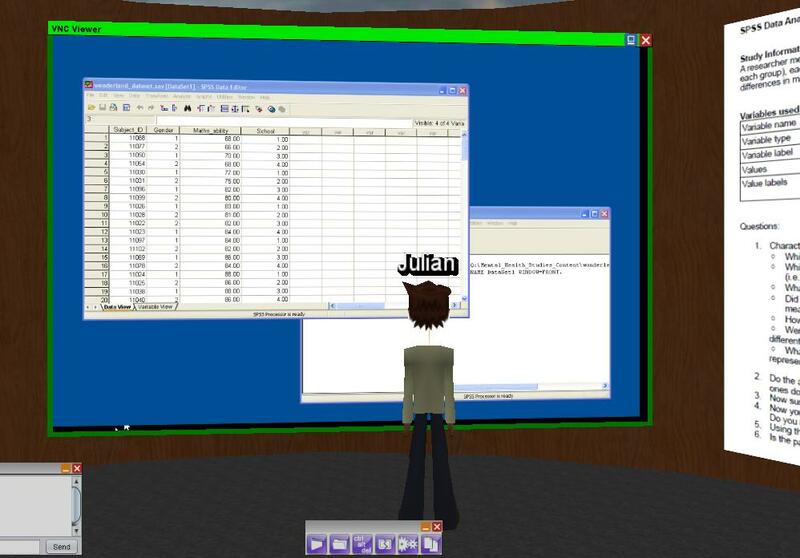 This engine is based on ALICE (Artificial Linguistic Internet Computer Entity) which uses an AIML-based (Artificial Intelligence Markup Language) interpreter to query and retrieve information. 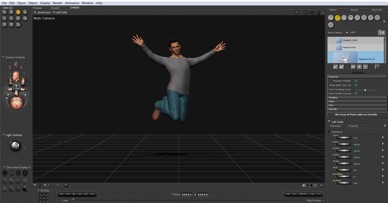 To integrate this technology into Open Wonderland, I experimented with both a Java-based AIML interpreter known as Program-D and a web-based AIML interpreter called Pandorabots. I ended up using Pandorabots for the Chatbot module prototype. Pandorabots uses the XML-RPC (remote procedure call) communication protocol. It uses XML to encode data, and it works by sending an HTTP request to the server. A client can interact with Pandorabots using a Bot ID. The main advantage of using Pandorabots is that it is easy for users to create and add knowledge to their chatbots by uploading AIML files. 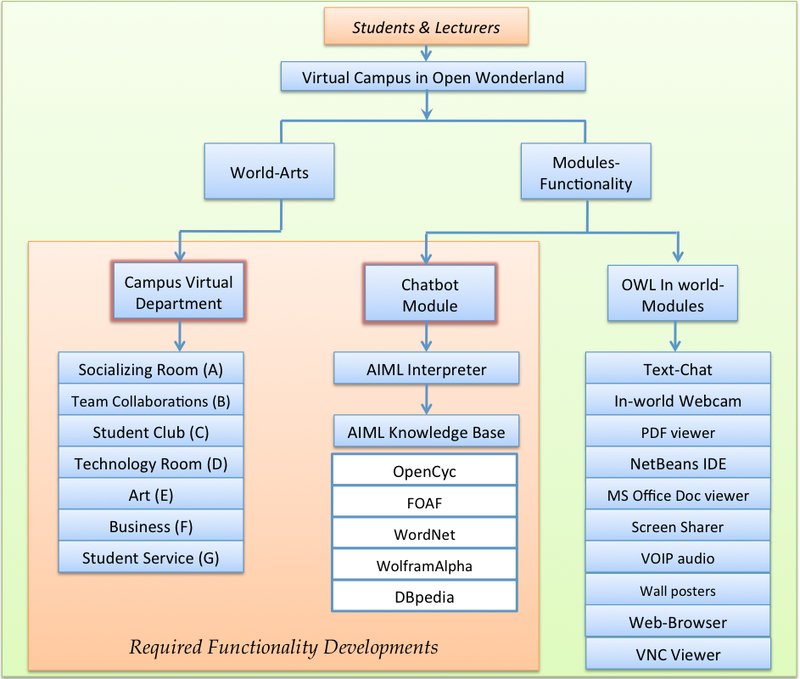 The diagram below illustrates where the Chatbot module fits into the structure of the Virtual Campus once it is complete. 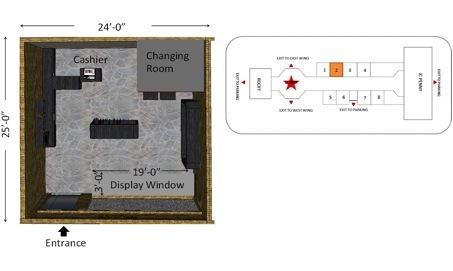 As envisioned, the Virtual Campus will include seven buildings covering many disciplines including business, arts, technology, team collaboration, socializing room, student club, and student service. Students will be able to get virtual resources from various specialized virtual departments and directly obtain relevant information easily. 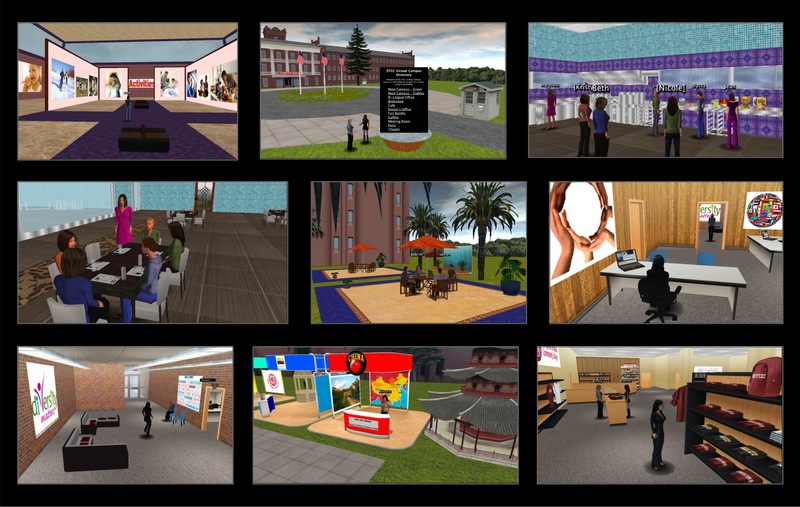 The Virtual Campus will also include non-academic rooms for entertainment. 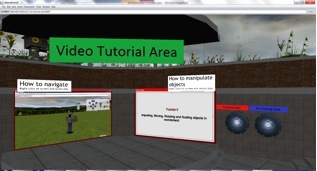 The chatbot functionality will be used throughout the Virtual Campus as an automated guide or instructor, able to interact with students to solve their problems. The AIML integration will allow us to interface with a variety of additional knowledge bases, such as WolframAlpha and DBpedia, allowing students to retrieve information from the chatbot without leaving the virtual world environment. 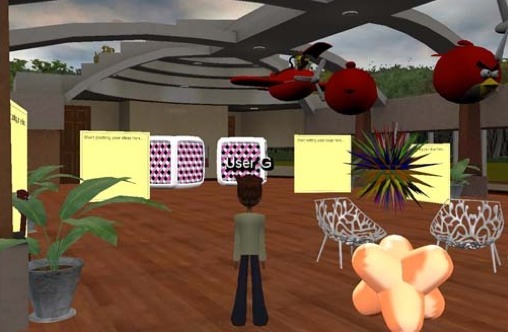 A big advantage of using Open Wonderland is that it is a great multi-user virtual environment engine that provides many functionalities and in-world applications that students and lecturers can utilize in the Virtual Campus. 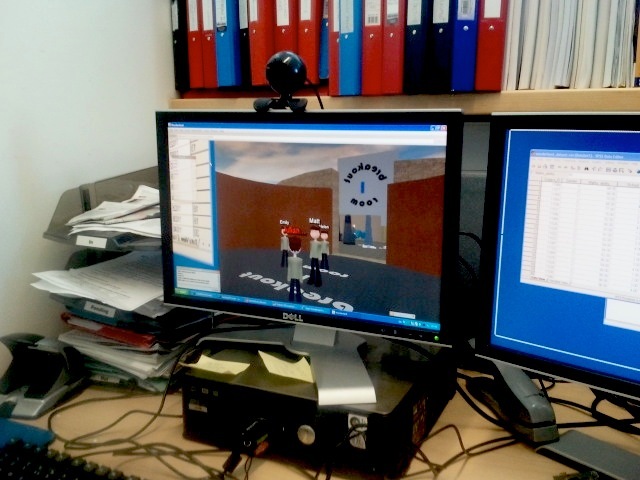 A well organized virtual campus can be the most efficient way for students and lecturers to collaborate. To support this collaboration, we are planning to use the PDF viewer, an in-world web browser, the Microsoft Office document viewer, text-chat, VOIP audio, webcam video integration, the Screen Sharer and VNC Viewer for desktop sharing, NetBeans for programming projects, in-world music players, wall posters, and the multi-user white board for discussions and sketching. 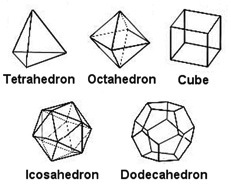 These tools, embedded in the virtual world, are similar to desktop-based applications. 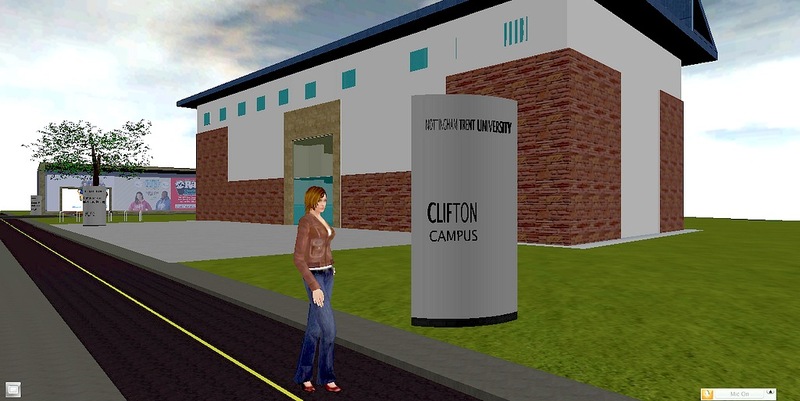 I have also made the source code for the Chatbot module available, as well as the 3D models used to create the Virtual Campus.